Find the coordinates of the point which divides the line segment joining (-1, 3) and (4, - 7) internally in the ratio 3 : 4. 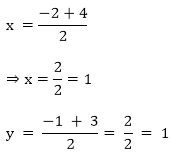 Let P(x, y) be the required point. Find the coordinates of the point where the diagonals of the parallelogram formed by joining the points (-2, -1), (1, 0), (4, 3) and (1, 2) meet. 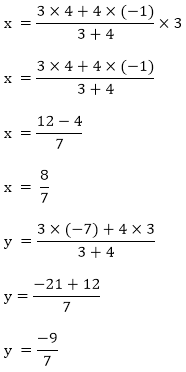 Let P(x, y) be the given points. We know that diagonals of a parallelogram bisect each other. 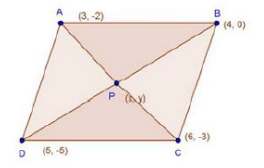 Prove that the points (3, 2), (4, 0), (6, -3) and (5, -5) are the vertices of a parallelogram. Let P(x, y) be the point of intersection of diagonals AC and 80 of ABCD. 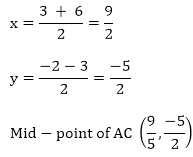 Here mid-point of AC — Mid - point of BD i.e. 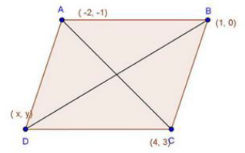 diagonals AC and BD bisect each other. Three consecutive vertices of a parallelogram are (- 2, -1), (1, 0) and (4, 3). Find the fourth vertex. 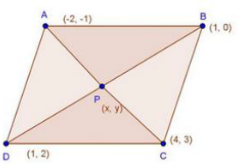 Let A (-2,—1), B (1, 0), C (4, 3)and D (x, y) be the vertices of a parallelogram ABCD taken in order. Since the diagonals of a parallelogram bisect each other. ∴ Coordinates of the mid - point of AC = Coordinates of the mid-point of BD.